To celebrate this first decade of life, next Thursday 27th September will be celebrated a great event in the Afundación Theatre of Vigo beginning at 19.00 hours. Gradiant is celebrating. On 27th September, we will celebrate its 10th anniversary with a great event to commemorate our trajectory, having developed more than 258 projects since its foundation in 2008. The event will take place in the Afundación Theatre of Vigo (Rúa Policarpo Sanz, 13) from 19.00 hours, the participants will be able to enjoy a journey through technological highlights of the decade and discover the latest trends in research. At the end of the event, there will be a cocktail – party. With more than 173 client companies in 29 countries, in the last year Gradiant has signed commercial agreements for the integration of its dynamic signature verification technology in Samsung’s Galaxy Note devices, or the incorporation of its technology for the detection of life in the app of the Ecuadorian bank Cooperativa de Ahorro y Crédito Policía Nacional (CPN). 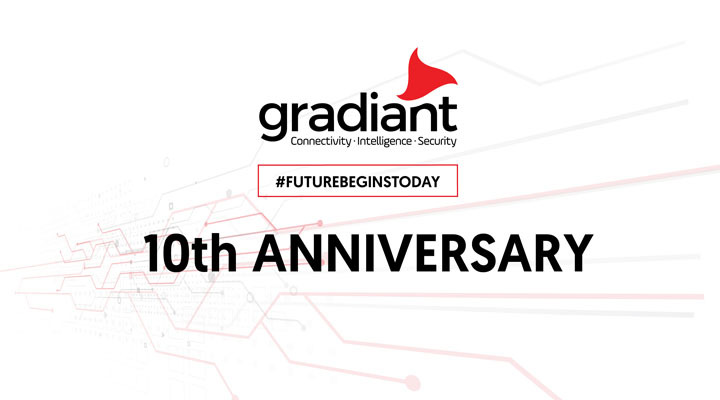 Ten years after its birth, Gradiant is today made up of more than 100 highly qualified professionals and obtained in 2017 an income of 5.2 million euros. Want to attend Gradiant’s 10th anniversary corporate event? Contact us at comunicacion@gradiant.org and we’ll tell you how. You can also follow the event through our Twitter account @Gradiant.